We are a licensed and insured pressure washing company with expertise in cleaning residential (homes), commercial (businesses), and multi-unit (apartment communities) properties. Ask around, we’re the best. We provide service to the Middle Tennessee area, including Nashville, La Vergne, Smyrna, Murfreesboro, Antioch, Clarksville, and more. We travel to any location to provide you with a detailed quote at no charge. Your schedule is tight, so our schedule is flexible. We work around your availability and do not collect payment until our work meets (or exceeds!) your expectations. We show up on time, provide exemplary service, and ensure that your property is cleaned in a safe and timely manner with no damage to surrounding landscaping. Our trained technicians can quickly and safely restore your home, business, apartment community, or rental property back to it’s original, new appearance. Our specialized surface cleaning equipment will quickly restore concrete and brick, such as driveways and walkways, back to their bright and clean look. We can bring your wooden patio, deck, fence, staircase, or children’s playground equipment back to life by removing mold, mildew, and stains. Here are some of our recent projects, before-and-after. Like what you see? Contact us for a free quote or to schedule an appointment. We provide custom, individualized quotes based on the type of job (pressure washing, surface cleaning, wood restoration), overall square footage, and other factors that will affect the time and supplies we need to invest into the job to ensure it is completed properly. Our quotes are free, so do not hesitate to contact us! What is your availability for jobs? Our goal is your satisfaction, so we can plan the completion of jobs around your schedule. We operate on a first-come, first-served basis and can schedule jobs for any day of the week. Whether you would like to be home, at work, or even on vacation when we complete the job, we can accommodate your needs. 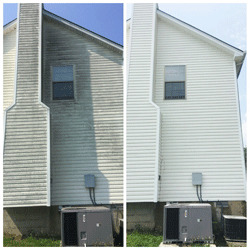 We are a licensed and insured business with extensive experience pressure washing all types of properties. 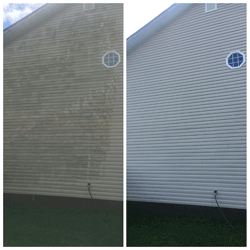 As the premier pressure washing service in Nashville, TN, we pride ourselves on the quality of our work which includes taking proper safety precautions. When selecting a company to pressure wash your home or business, please ensure that they have the necessary license and insurance coverage for your peace of mind. 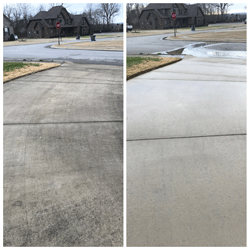 We are a mobile pressure washing company who provides service to the entire Greater Nashville and Middle Tennessee area, including Antioch, Murfreesboro, Smyrna, Spring Hill, Clarksville, La Vergne, Franklin, Brentwood, Bellevue, Bell Meade, Hillsboro, Old Hickory, Mt. Juliet, Hermitage, Goodlettsville, Hendersonville, White House, and more. We’re willing to travel, so even if your city is not listed, contact us for a quote and to schedule a cleaning! They’re very satisfied. You will be too.